This post originally appeared last March, about one of my favorite TV series, The Mary Tyler Moore Show. Although something very tragic had happened, the resulting humor is something we can all identify with - for better or worse. Considered by the Chicago Tribune to be the funniest TV comedy episode of all time “Chuckles Bites the Dust” on The Mary Tyler Moore Show concerned the death of Chuckles the Clown. Dressed as Peter Peanut, he was trampled by a rogue elephant during a parade. Mary’s coworkers immediately began to make jokes, and she was horrified by what she saw as nothing less than cruelty. Don’t be afraid to laugh, even in the midst of your tears. You can probably hear your friend laughing right along with you. 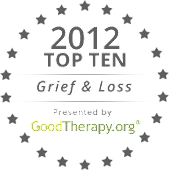 Viki, this is a great post on the many faces of grief- so individual, so unpredictable, so human. The vision of a loved one laughing along with you makes it alright. actually more than alright,downright essential. Laughter is the best medicine and Mary Tyler Moore the poster child for making it work.